This post is going up a bit later than usual — I generally schedule them for 8:30am, but since I didn’t finish reading this book until about half one this morning, I didn’t have time to write it any sooner. However, I figured a late post was better than no post, though I may drop down to a once-weekly schedule for the remainder of term time. We’ll see how I get on. I’d heard a lot about The Secret History from people on Tumblr. I saw Maggie Stiefvater’s review of it on Goodreads, and I saw a post that said it was basically an episode of Skins written by a Classics major. All of these factors meant I wasn’t at all sure whether I’d like it, but when I came across it in a charity shop for 50p, I figured I may as well give it a chance. I knew it would be a case of either loving or hating the book but I never thought it could be both. 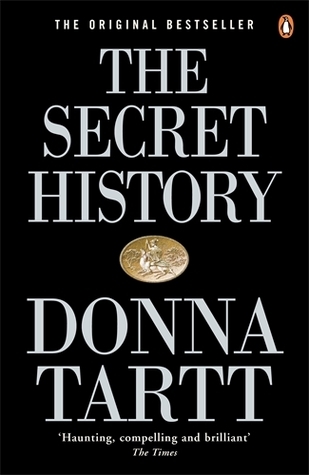 The Secret History is a very good book. In many ways it’s exceptionally good. But that doesn’t mean I enjoyed reading it. Actually, for the most part, I didn’t. I didn’t like any of the characters — they seemed despicable, whether that was due to Henry’s coldness and absolute disconnect from empathy, Bunny’s blatant sexism, homophobia, and downright unpleasantness, or the various snobberies and cruelties of the others. You’re not supposed to like them, I suppose, but such was my dislike of them that I couldn’t feel in the least bit sorry for Bunny when he died. That isn’t a spoiler, by the way — you’re told in the prologue that they killed him, and the first half of the book is spent wondering how and when that will happen. The second half is dealing with it. The plot is slow moving. For a book of around 650 pages which took me upwards of three days to read, surprisingly little happens. A lot of time is spent building up to various events, which are then over in a flash. The actual plot is… well, to be honest, it’s largely negligible. It’s a series of character crises, one after the other, but it isn’t action. The writing, in places, was pretentious. The narrator frustrated me, because he spent too much time musing on the nature of things and generally being the overly intellectual type of college boy that I detest reading about because they’re annoying. I couldn’t tell when it was meant to be set — it could have been the 60s or the 90s and I wouldn’t have known, except for a brief mention of the moon landing having happened. And yet I didn’t put it down. I didn’t put it down even though it took me ages to read and I had other books waiting and reviews to write. I didn’t like any of the characters, but I got thoroughly emotional about them anyway (well, apart from Bunny; I’m sorry, I just hated him). I got super invested in the ending, and the final pages left me somewhat shell-shocked. I disliked this book and yet it impressed me. I don’t understand how it can have hooked me when, generally speaking, I didn’t enjoy reading it. I don’t understand how I can have become so invested in characters I hated. I don’t understand why I wanted to know what happened next even when very little was happening. I don’t know how this book works! But somehow it does. I think I should pull it apart and learn how it functions because if this book can keep me reading even when I’m getting actively annoyed at it, then it’s a ridiculously good book. To paraphrase a description I once heard, it’s like being beaten with a piece of antique furniture. It hurts, but you have to admire the workmanship. It’s a good book. It’s so good that I read the whole thing even though I didn’t enjoy it. And I’m baffled by this. I don’t know how it works. Is this a book you should read? I don’t know. Are you prepared to cope with a bunch of college students who murder one of their friends? Are you prepared to hate them and yet at the same time care what happens to them? Are you prepared to be totally confused by how you can both like and dislike a book at the same time? Then go ahead and read it. But I won’t be rating it, because I have no idea where I’d even start. I’m just… baffled. Absolutely baffled. And sort of angry at the same time. I like to put books in neat categories: liked, disliked. This one doesn’t fit. My reaction to this entire book. Yes. Exactly. I really don’t like the characters. Bunny is the absolute worst. The book is riddled with casual bigotry, self-important qusi intellectuals, spoiled and classist college brats and an ambiguous decade setting. In spite of all that, the book is captivating. Donna Tartt’s characters can be so hateful and loathsome, yet we still care what happens to them. Perhaps there’s an intentional brilliance in that? I think it’s definitely brilliant, because a lesser book would’ve been thrown at a wall at a much earlier stage 😂 but yeah, it’s bizarre. It’s been like three years and I still can’t decide if I liked it or not. How??? How is that possible?